How warehouse management software can work for you. 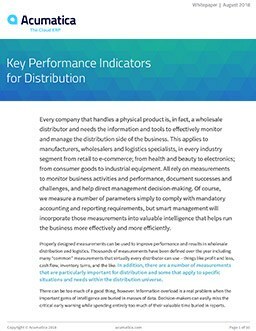 Acumatica WMS is part of Distribution Edition and integrates with the Acumatica Commerce Edition to help you accurately and efficiently manage your advanced warehouse needs in wholesale, manufacturing, retail and other industries. Automate routine picking, packaging, PO receiving, putting away, transferring, and physical counting (by using barcode scanners) tasks with customized workflows and form modes. This eliminates the risk of people skipping important steps, increases productivity, and reduces training costs. Warehouse management works with third-party EDI software for full EDI compliance, including 856 Advance Ship Notice (ASN), to electronically communicate the contents of a shipment. If you own a business, you know about working hard on a daily basis. You are laser-focused on the day-to-day operations. The fact is, however, you must look ahead and determine what your business will need in order to grow. Investing in inventory management software, thereby automating and optimizing your distribution management processes, is a necessary step. But whether you do it from the start or from where you are now, this investment can increase productivity and efficiency as well as enhance your business’ growth potential in the future.